As I have already mentioned in past blog postings I ended up with severe chronic neuropathic pain after my failed nose revision surgery in 2005 . What's interesting is that most rhinoplasty surgeons don't educate us lay people (patients) about the risk and complications that can arise from nerve injury during rhinoplasty. In fact not only are some rhinoplasty surgeons "apparently" at a loss about my complication, one reconstructive rhinoplasty surgeon mentioned to me during the consult that there are no nerves in area of where my pain is, which happens to be the lower third of my nose ( tip lobe area including columella). Really? Well a very quick search & scant amount of reading on the internet can easily debunk that tale. However if my memory serves me right he was the first one to suggest my nerve pain may be due to Traumatic Neuroma *1. Perhaps he meant there are no main nerve branches in the tip region where my pain seems to originate from. Anyway lets now turn our attention to the nerves within the human nose. Nerve supply to the nose is externally derived from branches of the trigeminal nerve. The skin of the nose superiorly at the radix and rhinion is supplied from branches of the supratrochlear termination of the ophthalmic nerve. The anterior ethmoidal nerve, another branch of the ophthalmic, may traverse the dorsum of the nose to supply the tip . In endonasal or in open rhinoplasty, this nerve bundle may be damaged by over-aggressive endonasal incisions violating the fibromuscular layer, or elevation of the S-STE (skin-soft tissue envelope) in the wrong plane, resulting in a numb nasal tip. The infraorbital nerve may also contribute branches to the lateral nasal walls, columella, and vestibule. Knowledge of this external nerve supply is necessary to perform adequate nerve blocks for closed reductions, or for rhinoplasty under local anesthesia with sedation. Intranasal anesthesia is also a prerequisite for these procedures. This may be performed with intranasal cocaine pledgets or other strategically placed topical anesthetics. 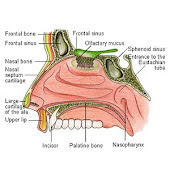 Perhaps the most important target is the sphenopalatine ganglion located in the posterior portion of the nose just posterior to the middle turbinate. 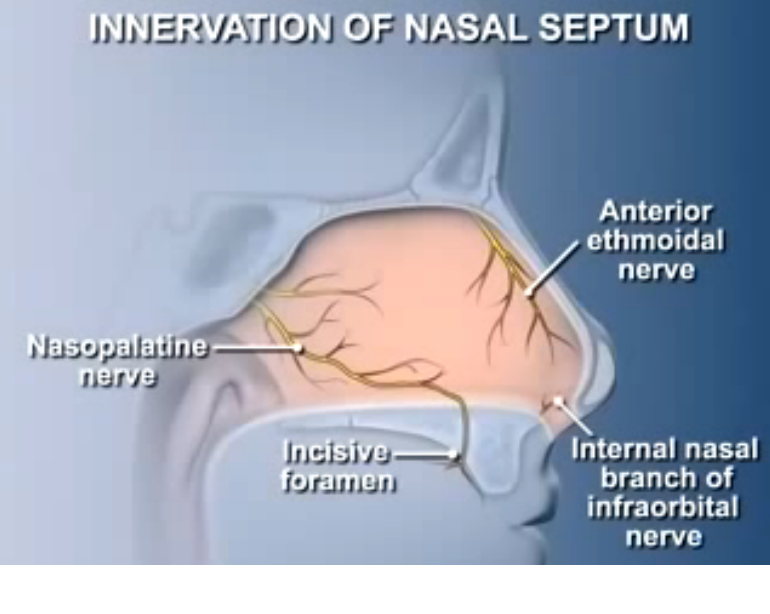 Internal branches of the anterior ethmoid must also be anesthetized in the superior portion of the nose to complete a total nasal block. 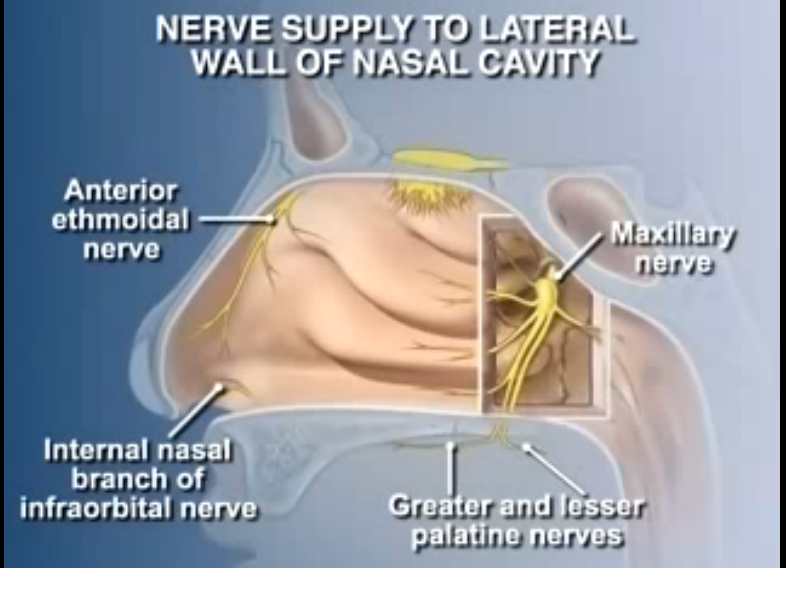 Nasal skin is innervated by the infratrochlear and external nasal branches of the nasociliary nerve, and by the nasal branch of the infraorbital nerve. The olfactory nerve is a special sensory cranial nerve that is responsible for the sense of smell. The receptors of these neurons are found in the olfactory epithelium and the axons pass through the cribriform plate of the ethmoid bone. These neurons synapse within the olfactory bulb which lies directly above the cribriform plate. I have been corresponding with someone who also developed nerve related pain and discomfort after revision rhinoplasty a few years ago. The person also had the open approach technique repeated along same previous surgical incision, as was done with my nose. This raises suspicion as to whether repeating the open approach technique along same scarred incision increases chances of developing neuropathic pain or neuroma's due to nerve trauma along skin tissue. Another possibility for explaining nerve pain or neuroma's is large removal of scar tissue along the columella /tip region resulting in a lot of new scar tissue development during healing period which may entrap nerve tissue. The open approach has become very popularized to the point that very few rhinoplasty surgeons are performing the more complicated but less invasive closed approach technique which has it's advantages as well as some disadvantages. So with more rhinoplasty surgeons performing primary and revision rhinoplasty with the open approach we may see a rise in unexpected complications due to trauma such as nerve trauma. *1 Traumatic neuroma follows different forms of nerve injury (often as a result of surgery). They occur at the end of injured nerve fibres as a form of ineffective, unregulated nerve regeneration; it occurs most commonly near a scar, either superficially (skin, subcutaneous fat) or deep (e.g., after a cholecystectomy). They are often very painful. Synonyms include scar neuroma, amputation neuroma, or pseudoneuroma.